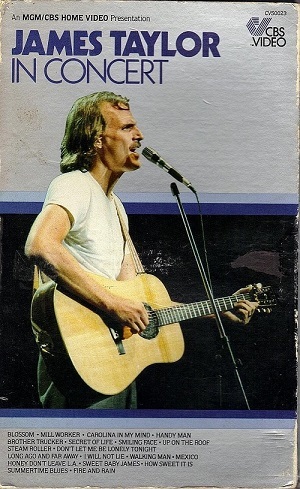 Recorded summer of 1979 at the Blossom Music Festival. Not to be confused with the 1988 video of the same name. Recorded in March 1988 at the Colonial Theater in Boston. Not yet released on DVD. A video of the same name was filmed at the Blossom Music Festival in 1979. The complete set list was broadcast by PBS, but the video release cuts several songs. Filmed in JT’s barn on Martha’s Vineyard. Includes interviews and performances recorded during rehearsal for a live tour. Version called “Going Home” shown on the Disney Channel in April 1992. Recorded at New York’s Beacon Theatre on May 30, 1998. Broadcast live on PBS television. JT is honored for his philanthropic work at a star-studded event held February 6, 2006. Recorded July 19 & 20, 2007 at the Colonial Theatre in Pittsfield, MA. CD/DVD set featuring interviews and multimedia footage, including home movies and photographs from JT’s personal archives. Two-Lane Blacktop (1971) – JT stars as “The Driver” in this classic road movie. Also available in a feature-packed 2-DVD Criterion Collection version. Saturday Night Live: The Second Season – JT performs “Shower the People,” “Road Runner,” and “Sweet Baby James” on the season’s first episode. No Nukes (1980) -VHS- From a series of star-studded anti-nuclear concerts featuring JT and many other stars. Also availableon CD. In Our Hands (1984) – DVD- Massive anti-nuclear concert in NYC featuring JT and many others. The Concert For New York – JT performs “Up On the Roof” and “Fire And Rain” for this all-star benefit. Sing Yourself Silly – JT performs “Jelly Man Kelly” on this Sesame Street children’s video. Also see the “In Harmony” CD release. Art Garfunkel: Across America – JT makes an appearance on this Art Garfunkel video. Crossroads Guitar Festival – JT performs at this all-star 2004 concert. Appalachian Journey – Also available on CD. Working (1982) – JT plays the role of the truck driver in this PBS TV production. “The Simpsons” Season 5 – JT plays himself in the “Deep Space Homer” episode from this season.